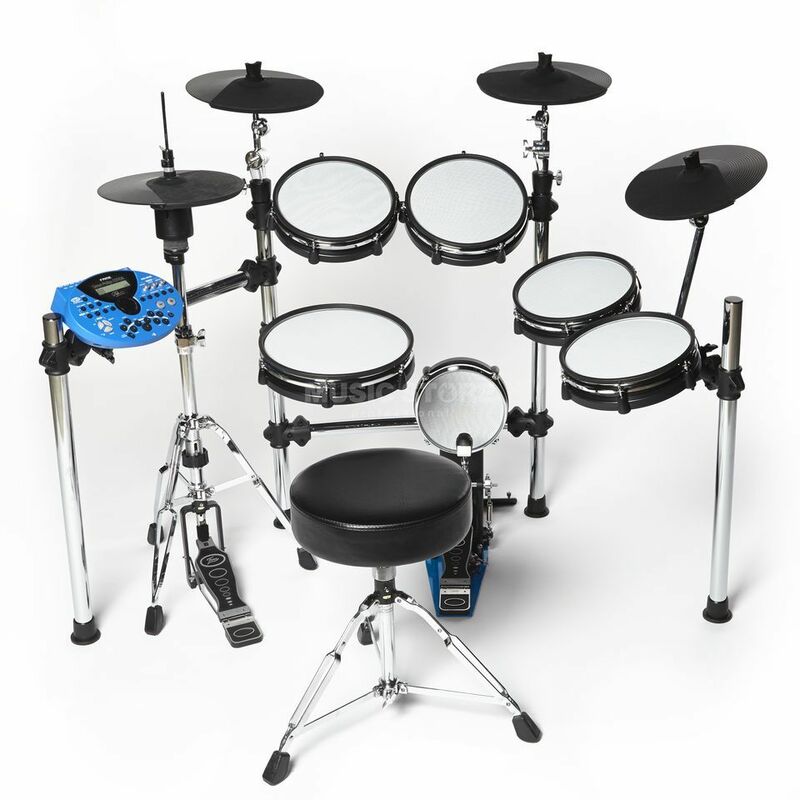 The Fame DD-ONE Simon Phillips Edition is a 10-piece e-drum set with a professional chrome rack, a real hi-hat and a modern sound module, for which Simon Phillips (ex-Toto) personally designed the 116 drum and cymbal sounds recorded and developed in his recording studio in Los Angeles. The E-Drum set by Fame is equipped with mesh heads, state-of-the-art trigger technology and high-performance software, leaving nothing to be desired even for professional drummers. In addition to the original Simon Phillips signature sounds, numerous percussion sounds are stored on the module, which were recorded in a Cologne recording studio and elaborately processed in the in-house sound development department of the Music Store to create an ultra-dynamic sound. The hi-hat stand and the Fame single pedal, which are included, comes from the professional 9000 series hardware. Sound module and base plate of the pedal are both in the new Music Store Simon Phillips Blue and thus perfectly matched in color. Simon Phillips is one of the most famous and respected drummers in the world, playing technically and musically at the highest level and considered an idol for many generations of drummers. For the Music Store Professional. the former Toto drummer has developed and recorded exclusively a sound pool with 116 drum and cymbal sounds, which was recorded in his Los Angeles studio with his original equipment and has professional high-end drum sounds. The precise drum samples reproduce the world-famous Toto sound and give every drummer the opportunity to play in their own home or in the rehearsal room with professional sound. There are 8 pre-configured kits and 70 user kits at your disposal. All sounds were exclusively played and developed by Simon Phillips - only at Music Store! Other than the regular Fame DD-ONE Professional, the Simon Phillips version has a high-quality chrome rack that can withstand professional requirements with ease. The professional drum rack is relatively light and can be easily and conveniently transported. The individual elements are also very flexibly positionable to implement your personal ideas of the perfect setup. All required pad and cymbal holders as well as the high-quality Gewa HiHat stand and the Fame single pedal FP9001-B are included. In the optically redesigned Fame kick pedal, the color of the base plate is adapted to the blue of the module, so there is a coherent overall picture in terms of appearance and design. Please note: The throne is NOT included! The Fame DD-One Simon Phillips comes with a total of 4 cymbal pads, all with a diameter of 12 ": 2x Crash Cymbal, 1x Ride Cymbal and 1x HiHat Cymbal. The special feature of the hi-hat: It is, like you are used to from acoustic drums, mounted on a conventional hi-hat stand (included), an open or closed hi-hat sound can be played by foot. The Ride Cymbal is a dual-zone pad and has an extra large bell that comes with an extra bell sound that can be assigned. A wide range of additional connections to the sound module allows easy integration of trigger and sample pad equipment. The MIDI port can be used to connect to a computer, for example, to trigger own sounds stored on the computer. A CD or MP3 player can be connected via the AUX IN to play your favorite music. Amplifiers or monitor boxes are connected to the Fame Sound module via the output (R, L / MONO). An SD card slot allows you to save your drum kits on an external SD card. Finally, the phones output is for use with headphones. The Fame single pedal FP9001-B is a nicely equipped bass drum pedal for professionals with a blue lacquered base plate. The extremely robust construction offers flexible adjustment options, which gives this Fame pedal top marks in terms of performance and durability. The 2-way Beater is driven by a double chain. The angle of the splitboard kick plate is adjustable independently of the angle of the beater and the spring tension. Rubber padded claws and an attached tuning key complete the great features of the pedal.